You didn’t think I’d leave you wondering what the last five things your college website should do are for too long, did you? Read on for your last five checklist items (plus a few more because we like you). If you missed the first five, here they are. 6. They ensure a flawless tablet and mobile experience. Because 46% of prospective students rely solely on mobile devices to search for college information, almost half of prospective students only see how the site looks via their phone or tablet, avoiding the desktop version altogether. The best sites are built with responsive design, meaning they automatically detect what type of device the viewer is using – a laptop, desktop, tablet, or mobile phone – and format the site and its content to fit the device, from an iPad mini to an Android smartphone to a two-in-one tablet. Your action: Test your site on your mobile device or tablet. Are you seeing the same stellar site that you see when you access it on a desktop computer or laptop? If so, check this off. 7. They dominate search engine results. Bear with me, this is going to be a long, but interesting, one. 90% of the time, people who search online will not venture beyond the first page of their Google search results. This is why companies pour so much money and effort into search engine optimization (SEO) every year: to compete for the 10 to 15 coveted spots on this first page of results. How does your site measure against this stiff competition? Prospective students may stumble upon your site by entering any combination of thousands of possible keywords, but this will give you an idea of how SEO-friendly your site is: Enter the keywords “Distance Education Program” (or “engineering program” or “grad school” or whatever is a non-brand-specific way to describe your program—don’t enter your brand name as you search as not all students aren’t going to search for your program by name) into Google. What populates your first search results page? If your site’s on the list, you’re definitely doing something right. If not, try boosting it through a variety of SEO and online advertising tactics, including PPC (Pay-Per-Click) advertising. Start another Google search for higher education programs and take a good look at the search results page. See those top three listings, the ones with the small yellow word “Ad” next to them? Those are not naturally ranked listings; they are paid ads. The ads in the right hand column (also under the yellow word “Ad”) are also paid. These are pay-per-click ads, meaning the sponsor of the ad pays every time someone clicks on the ad. This is how PPC works: you register with Google, you fund the account with a credit card, and then you pay everytime someone clicks on a relevant term. For example, if you are offering a distance learning art history class, you might bid on the search term “virtual art history class”. Then you pay every time someone clicks on your ad and is directed to your site. Pay per click (PPC) ad campaigns can be very effective – or very expensive – depending on how well you understand the marketing space. PPC is a guaranteed way to rank on a search engine, ensuring you will get your ad in front of people searching for those keywords. Your action: Because optimizing your site and targeting your advertising efforts will show you a much higher return on your marketing investments, reach out to an internet marketing expert to learn more about SEO and PPC advertising. 8. They track everything that matters. How long do visitors stay on the site? 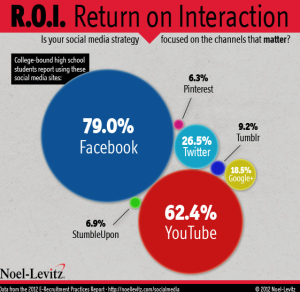 Which site pages are engaging students? Which calls to action are working? Which aren’t? Which keywords are bringing in traffic? What actions do visitors take while on your site? Your action: Do some research into analytic tools that measure site SEO, PPC campaigns, email campaigns, and page visits. Reach out to your IT support as you learn how to use these tools and figure out how to generate reports, interpret those reports and turn the numbers into marketing plans. Something I’ve learned: You will save yourself a lot of time and money if you find analytic tools that work together rather than spend time and money on multiple tools that work independently of one another. Fortunately, there are now sites that have built in analytic tools that produce customizable reports. These tools can help you measure and manage your marketing efforts, maximizing your productivity. Extra credit: Because you are an educational institution, your site also needs to be section 508/ADA (Americans with Disabilities Act) compliant. If you do not know what the standards are for being ADA compliant, let me help through a free ADA compliance analysis [LINK to analysis]. 9. They follow up with EVERY prospect. The best sites establish connections that enable follow up with every prospect, no matter where they are in the engagement process. Prospective student interested in more information? These sites get them to sign up for an email list or to register to download a FAQ sheet. First time visitor to the site? These sites get them enrolled in a retargeting marketing strategy. Student registering for a campus visit? The sites schedule a follow up email or call. Your action: You know you need to put your program in front of the student again and again, without annoying him or her, but did you know that your site can do this automatically, with little or no need for human hours? Look into autoresponder email campaigns to learn how to master this piece of the puzzle. 10. They engage prospects via social media. These 100 colleges are great examples of institutions that have a social media component that prospective students find interesting, fun, and engaging rather than dry of salesy. Your action: Beyond just participating on Facebook, Instagram, Twitter and the usual suspects, consider creating your own “insider” social media platform, an exclusive community that appeal to current and prospective students alike. Try setting it up so prospective students can only access certain parts of the platform, and insiders (registered students) can use all the features to meet other students, study online, share information, post pics, and ask questions. We’re here to help make your site one of the best. Now you know what the best sites are doing and what you’re already doing right. Want help implementing some of these best practices that you haven’t gotten around to yet? That’s exactly what my team of designers, developers, marketers and writers is here to offer. Let me tell you a little about us: Verified Studios has been designing higher education sites since 2008. We’ve meticulously analyzed site performance, recording what efforts deliver results. We’ve used our experience to develop tools like Collegiate Suite to produce compelling higher education site templates that deliver exactly what students are looking for in a college program site.